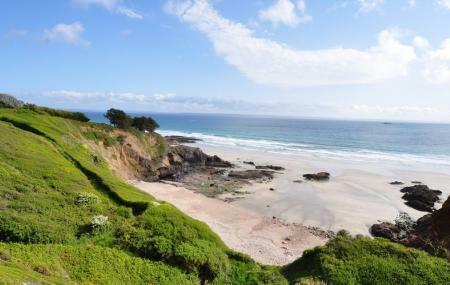 For scenic drives close to Brest, nothing beats the Crozon peninsula. You can also cover it on a cycle though. Though it’s impossible to cover all the highlights below on a single trip, pick and choose a few which sound nicest to you and make a day trip of it. If you visit Crozon town on specific alternate Wednesdays, you may catch the market. Morgat, about 1km from Crozon, has a long and beautiful crescent shaped beach. Camaret is one of the loveliest seaside towns you’ll ever see; the pinkish Chateau de Vauban is prominent landmark. The beach Palud Plage is gorgeously wild with some dramatic looking cliffs. Check out the coastal section of the GR34 long-distance footpath. Landoudec has some prehistoric menhirs. Argol has a 17th century church with pretty frescoes. Pont-Croix has steep cobbled streets, granite houses and the Roman Gothic 13th century church, Notre-Dame de Roscudon. The headland at Pointe de Raz is one of the few Grand sites of France. Le Faou is said to be one of the most beautiful villages in France; check out the 16th century Church of Saint-Sauveur. You’ll have to have a car or cycle to drive it to and back from Crozon. How popular is Crozon Peninsula? People normally also visit Landevennec Abbey Museum while planning their trip to Crozon Peninsula.